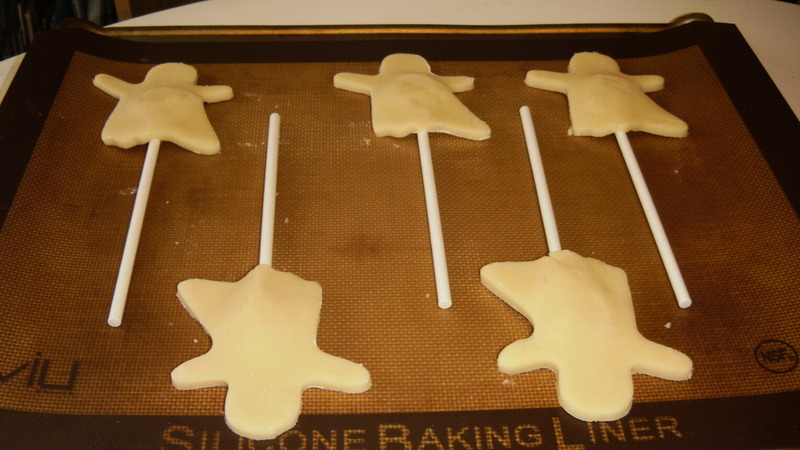 Posted on October 28, 2011 by Susan H.
Who can resist a cookie on a stick? It’s an indulgence…decadant…pure fun! It certainly is not your everyday cookie…..perfect for a party. 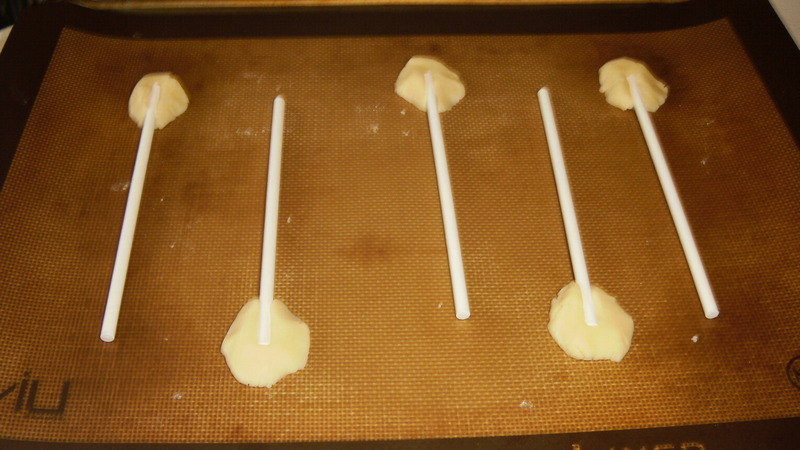 I have always marvelled at cookies on a stick… eager to try baking them myself. With dairy, egg, sesame, and peanut/tree nut allergies in the home, buying them was out of the question. So when an opportunity to make them came up…I took it! 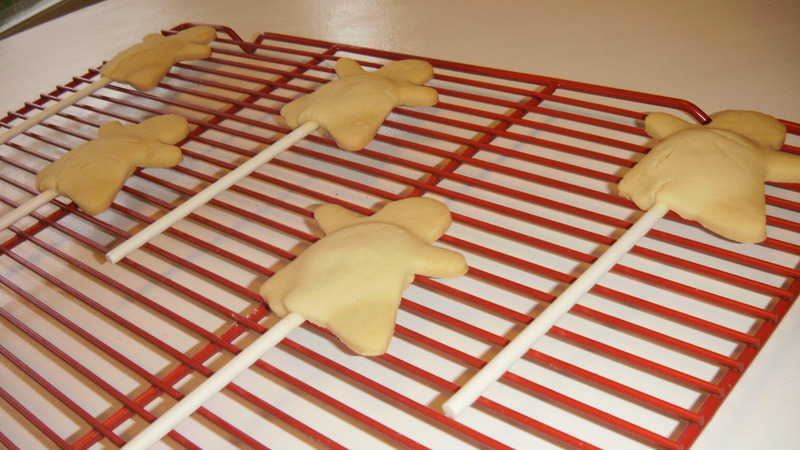 I used the baking suggestions for cookies on a stick, from Canadian Living Magazine’s November 2006 issue. The Sugar Cookie recipe is my childhood favourite. My mom called them ‘Holiday Cookies’. I can still remember pulling out the dishwasher and rolling the cookie dough out on the wooden cutting board top. My mom and I would only bake, ice and decorate them for Christmas. (Not sure why) The smell of them baking in my kitchen always stirs up memories of Christmas Holidays past. ‘Holiday Cookies’ were my ultimate favourite Christmas cookies to bake and eat. I am so happy to be able to adapt them for my boys to enjoy. Hopefully these cookies will conjure ‘sweet memories’ for them too. In a large bowl, cream the dairy-free margarine and the sugar. Beat in the vanilla and water until well combined. Gradually add flour mixture to the creamed mixture until well combined. 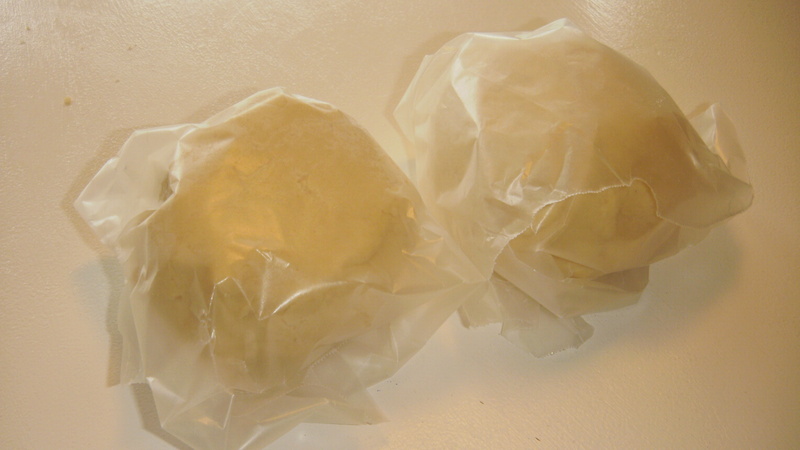 Divide dough into two balls, wrap in wax paper and chill in refrigerator. Lightly flour a sheet of wax paper or plastic sheet and roll dough out to 1/4 inch thick. 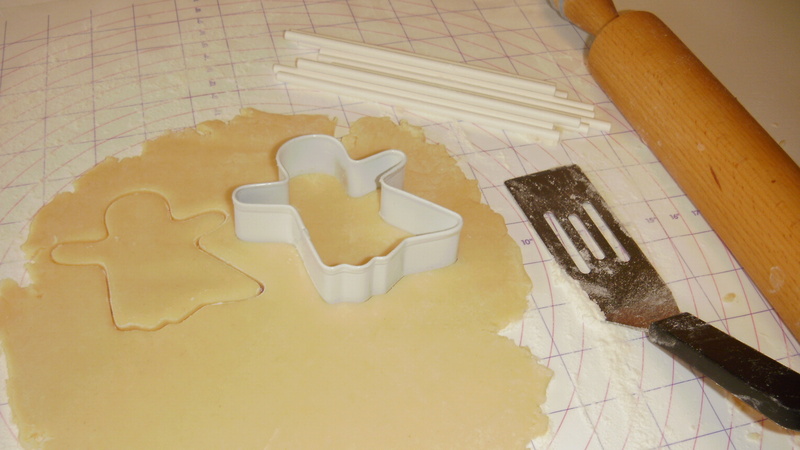 Dip cookie cutter in flour and cut out shapes. Roll 5 balls using a tsp of dough for each ball. Place 5 balls on silicone or parchment paper lined baking sheet. Press into 1/4 inch thick discs. Press a cookie stick into each disc. Top with cookie cutout, pressing lightly to adhere. Bake at 350 F for 10-12 minutes. Cool cookies on baking sheet for 1-2 minutes then transfer to a cooling rack. When completely cool, ice with Dairy Free Vanilla Icing. I decorated my ghosts with Enjoy Life chocolate chip eyes and mouth. Tip: I used my 40% off coupon to purchase the cookie sticks from Michael’s and the Hallowe’en ribbon was 50% off. 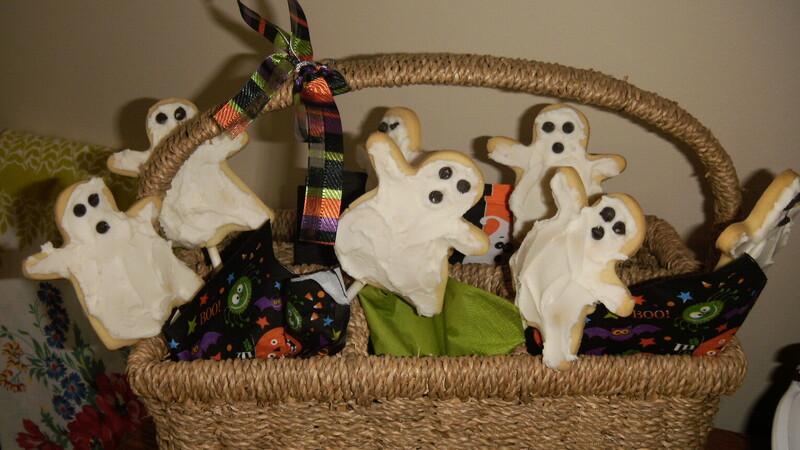 This entry was posted in baking, cookies, dairy free, dessert, egg free, Hallowe'en, peanut/tree nut free, sesame free and tagged dairy free sugar cookies, egg free sugar cookies, ghost sugar cookies on a stick, peanut/tree nut free sugar cookies, sugar cookies on a stick by Susan H.. Bookmark the permalink. These are so cute! Cookies on a stick just make regular cookies so much classier I think. Hi Liz- Most definately! 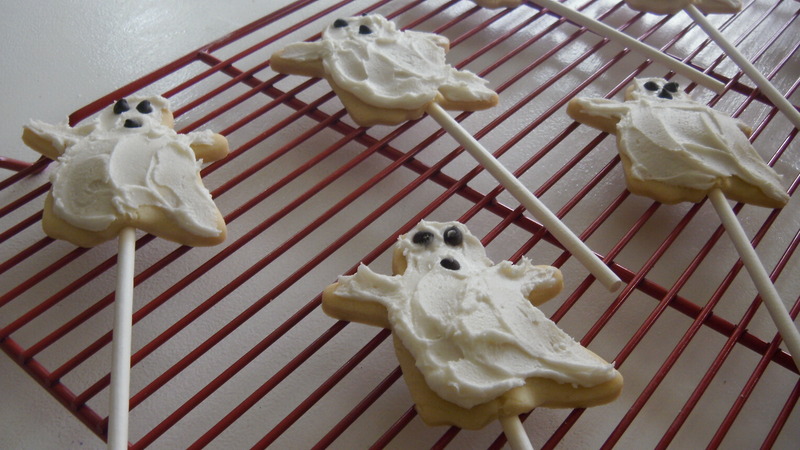 I will be baking a batch for Matthew’s class for Monday…they are reading their spooky Hallowe’en stories and I am providing the allergy friendly treat!~ Susan H.